Or, at least I do. For him pointing me here. That, my friends, is how to get virtually lost in books. Ben Barnhart is actually a very nice man and I blame him for nothing. He's the editor and Digital Operations Manager at Milkweed Editions. Milkweed is publishing a novel this coming fall that we're really excited about. "Vestments" has a lot going for it from our angle. Gorgeous cover+great publishing house+local writing talent. It comes out 9-1-2010 and you can read a little about it at its very own page. ack--the link points me nowhere. a zen statement, perhaps? saying get off the internets in order to get lost in books? i love that picture. 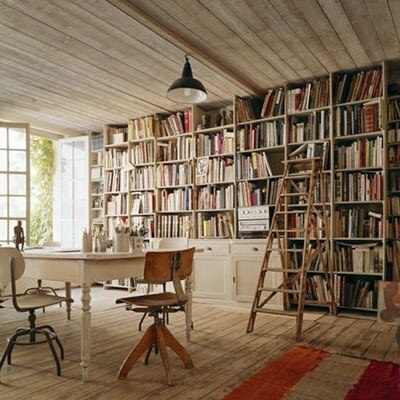 i could live in that room. Thanks, Laurie. The link is now fixed. Me and my link humor.